The independent documentary film 'Endless Corridor', commemorating the victims of the Khojaly Massacre, has been screened in Florence. The event was organised by The European Azerbaijan Society, Azerbaijani Embassy to Italy, and EURASIA European Association for Cultural Exchange Italy–Azerbaijan, under the auspices of the international Justice for Khojaly campaign. Without doubt, this constitutes one of the greatest injustices of our times and is a flagrant violation of Azerbaijani territorial integrity and international law. On 4 March, the multi-award-winning independent documentary Endless Corridor – a US/Lithuanian co-production – was shown amidst the rococo carvings and mirrored walls of the 16th century Palazzo Borghese in Florence. The screening, organised within the Justice for Khojaly campaign, commemorated the victims of the Khojaly Massacre on 26 February 1992. This was the worst single atrocity of the Armenian–Azerbaijani conflict over Nagorno-Karabakh and claimed the lives of 613 civilian victims in 1992. The death toll included 106 women, 63 children and 70 elderly people. The event was organised by the Azerbaijani Embassy to Italy, The European Azerbaijan Society (TEAS) and the EURASIA European Association for Cultural Exchange Italy–Azerbaijan, under the auspices of the international Justice for Khojaly campaign. Following its international premiere throughout 2015, Endless Corridor has received plaudits from critics across the world. It has received the Best Documentary and Best Director for a Documentary Prizes at the Tenerife International Film Festival in Madrid; the Best Documentary Editing Prize at the Milano International Filmmakers Festival; and in the prestigious US-based Accolade Global Film Competition, it achieved two awards – Best of Show in May 2015 and in January 2016 the Outstanding Achievement Award in the Accolade Humanitarian Awards 2015. It has also been screened on the pan-European Eurochannel, CNN Turk and TV 24 (Turkey) channels. 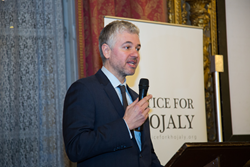 Jack Pegoraro, Manager, TEAS UK, commented: “Tonight is one of a series of events organised by Justice for Khojaly in order to remember the events of 24 years ago, when invading Armenian troops massacred 613 unarmed men, women and children in the Azerbaijani town of Khojaly. The evening was dedicated to the memory of the Khojaly victims and those Azerbaijanis who have only one wish – to return home.